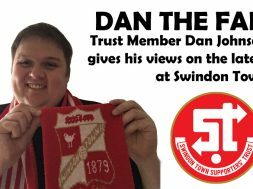 The first in an irregular series sees Swindon Town fan ROB FRANCIS pop in the TrustSTFC.tv time machine to revisit games past. The first time Swindon met the Posh was in an FA Cup second-round match in 1955. Town were having a dreadful time of it, and went into the tie bottom of the Third Division South, where they would also finish the season. 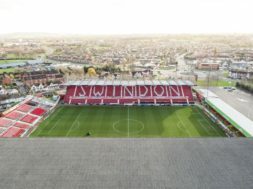 Swindon had also been operating without a permanent manager since Maurice Lindley was relieved of his duties in April, with the board and the club trainers picking the team. Peterborough, by contrast, were on the start of something special. 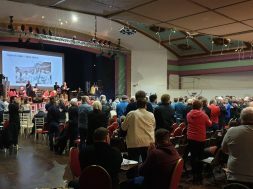 In both 1953/54 and 1954/55, they had finished in the top three of the Midland League, and they would go on to win the title five times in a row, scoring more than 100 goals in each season. In the previous round, Posh had defeated third-tier opposition, overcoming Alf Ramsay’s Ipswich Town at London Road. So despite Peterborough being a non-league side, they would be no pushover. At the County Ground, Denis Emery gave Posh a first-half lead in front of over 23,000 spectators; an attendance which remains a record for this fixture. Maurice Evans grabbed an equaliser midway through the second half, taking the tie to a replay. Five days later, the Midland League side were eventually beaten 2-1 after extra-time with a Jim Cross goal. At the end of the 1955/56 season, Peterborough would seek election to the Third Division South after winning the Midland League title. 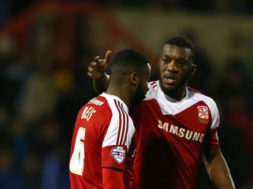 They received eight votes, some way behind the teams re-elected to the Football League, including the side that finished last in the table – Swindon Town. Every Swindon fan will go misty-eyed at the thought of the 1992/93 season. As manager, Glenn Hoddle got the team playing a brand of football that was both easy on the eye and also effective enough to take Town up into the Premier League via a dramatic play-off final win over Leicester City. Peterborough were also in rude health. Under Chris Turner’s management, Posh had won successive promotions, and were playing their first ever season in the second tier; they would go on to achieve their highest ever Football League placing, with a very creditable 10th-place finish. This fixture was moved to Sunday afternoon due to ITV screening the match. As a result, Swindon knew from the previous day’s results that a victory would take them second in the table, and into the automatic promotion places. It was not to be, but the viewers watching at home saw a great game of football. The scoring started after only three minutes, Tony Adcock running through the Swindon defence and lifting the ball over Nicky Hammond. Town soon equalised with the tried and tested method of Nicky Summerbee taking a corner for Shaun Taylor to head in, but before half-time Peterborough were back in front. This time, Taylor was involved at the wrong end, jumping in front of Hammond to head into his own net. In the second half, David Mitchell and Craig Maskell combined brilliantly to tee up Micky Hazard, who put the ball into the net only for the goal to be wrongly ruled out for offside. Peterborough’s reprieve didn’t last long however; barely five minutes later, Kerslake crossed for Maskell to make it 2-2. With thirteen minutes left, Swindon won a free-kick from a foul which Glenn Hoddle was convinced occurred inside the penalty area. Fortunately, the decision to not award a spot-kick was rendered irrelevant as Hoddle’s free-kick was headed in by Shaun Taylor. Swindon led 3-2 with a little over 10 minutes left. But this was not the end of the scoring. Hoddle played the ball back to Hammond, whose attempted clearance fell straight to Adcock, and the Peterborough forward placed the ball past the despairing goalkeeper and into the net. 3-3. Great television, but hugely frustrating for Town fans. Two days after the match, Chris Turner, who had given Peterborough so much to celebrate over the past two seasons, resigned as manager to become chairman at the Posh. The glory days of the 1990s had long gone by 2001. After finishing rock bottom of the second tier in 1999/2000, initially there was optimism about Town’s upcoming campaign. Colin Todd had taken charge in May and brought in almost a whole new team following relegation, and with new chairman Terry Brady set on building the club a new stadium, the future seemed promising. However, Todd resigned in October with Swindon in the drop zone to become assistant manager at Derby County, and Brady’s plans for a move were frustrated. Andy King took the reins following Todd’s departure, and by the time Peterborough came to town at the end of April, Swindon were one place and one point above the relegation zone with two games remaining. Bristol Rovers, the side below the dotted line, had four matches left to play; hence the clash with Posh was a must-win game if Swindon were to stand any chance of avoiding the drop. Peterborough themselves were safely ensconced in mid-table, in their first season back in the third tier after winning promotion through the play-offs in 2000. The match started promisingly for Town. Keith O’Halloran crossed for Gary Alexander to head home after seven minutes, and Swindon went in at half-time a goal to the good. Prospects improved further when Posh’s Dean Hooper was sent off shortly into the second half; however, this is Swindon, and things are never straightforward. With 15 minutes left, indecision between Alan Reeves and Steve Mildenhall about who should deal with a through ball led to Reeves poking the ball past his own goalkeeper and into the net. Salvation came in injury-time, with Danny Invincibile smashing a left-foot volley past Mark Tyler in the Peterborough goal to take the three points. This left Swindon four points clear of Bristol Rovers, who contrived to lose both of their games in hand at home to sides who had very little to play for, meaning that Town were assured of safety ahead of their final match. Despite avoiding relegation, Andy King would be sacked before the start of the following season. 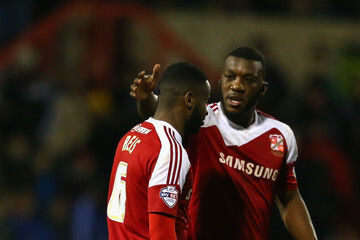 The 2013/14 season saw both Swindon and Peterborough chasing promotion from League One. Posh had been relegated from the Championship the previous season and were targeting an immediate return under Darren Ferguson, while Swindon were not expected to challenge; Town’s board had set about reducing the wage bill after two seasons of overspending under Paolo Di Canio’s management, and had appointed the former assistant Mark Cooper as boss, a relatively inexperienced choice which did not enthuse the fans. Despite this, Swindon were in the race for the play-offs throughout the season. Both league encounters were tight affairs; Posh won 1-0 at London Road, but Swindon took the three points at the County Ground in a 2-1 victory where Peterborough finished the game with 10 men. It proved just as difficult to separate the clubs in the Johnstone’s Paint Trophy, with the sides meeting in the two-legged Southern Area Final. The first leg at London Road saw Swindon fall two goals behind in the first 14 minutes, before rallying to go in level at half-time. There were no further goals in the second half, so the second leg would start with the tie all-square. Back at the County Ground, the former Peterborough midfielder Alex Pritchard gave Swindon a half-time lead after a bit of pinball in the box, but this was cancelled out by a Britt Assombalonga header with a quarter of an hour remaining. Extra-time was goalless, so the tie was decided by penalties. After Tijane Reis put his shot wide, Tommy Rowe scored his spot-kick to win the shoot-out 4-3 and send Posh to Wembley.